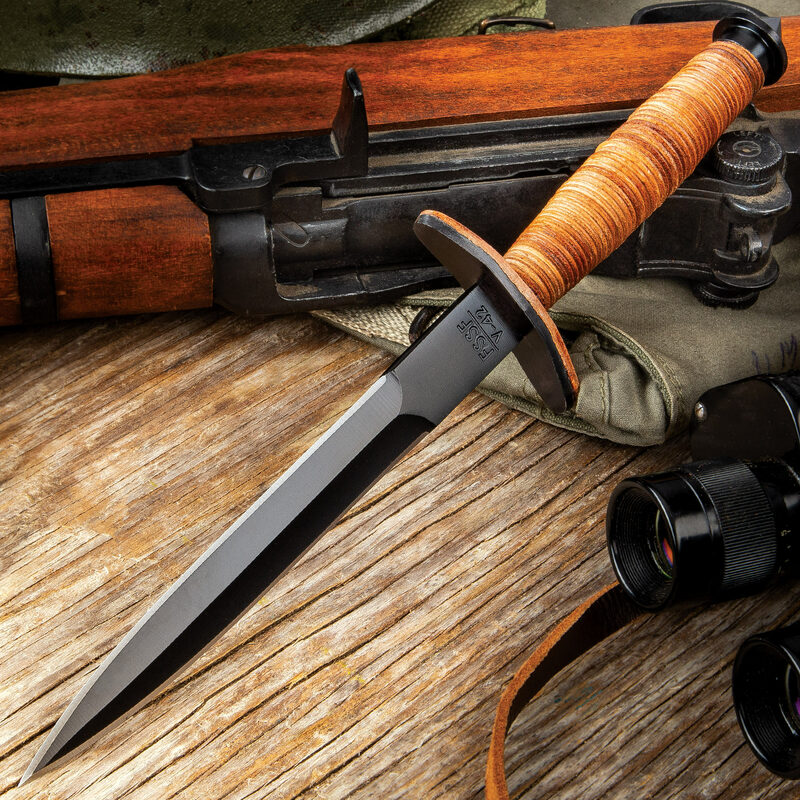 Inspired by actual military use and history, our top-quality V-42 stiletto dagger is a replica of the original, designed in part by Lt. Colonel Robert T. Frederick, commander of The Devil's Brigade. This double-edged replica features a steel spear point stiletto blade met by a generous guard to protect your hand and keep it from slipping to the blade. 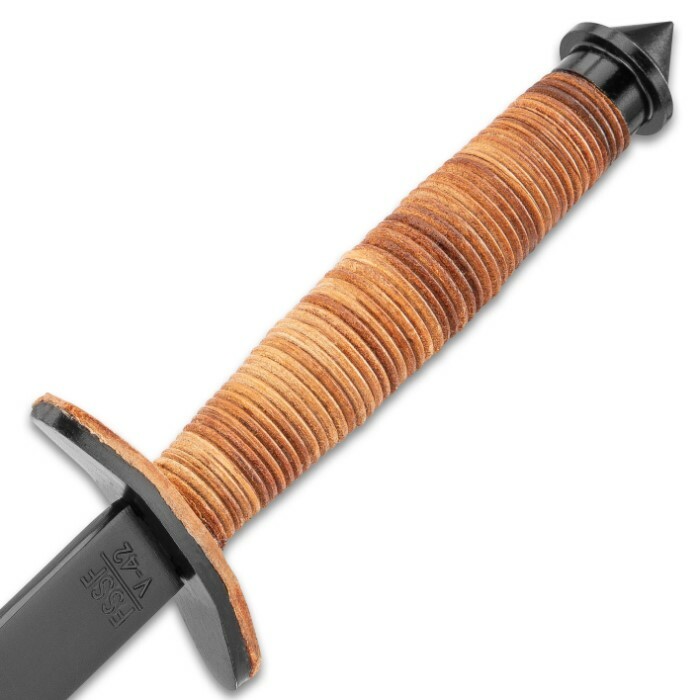 Just like the original, the handle is crafted of stacked leather for a combat-quality grip. The spiked pommel design will also inflict some serious damage. It's an authentic size, too, at 12-5/8" in overall length with a 7-1/4" blade. Includes a custom leather sheath. Well designed. Really liked it and was worth the money, but it's a shame it wasn't made of gun steel or high carbon steel. I still like it though. After looking at the mixed reviews I took a chance and ordered this. Blade is sharp and tight glad I ordered. 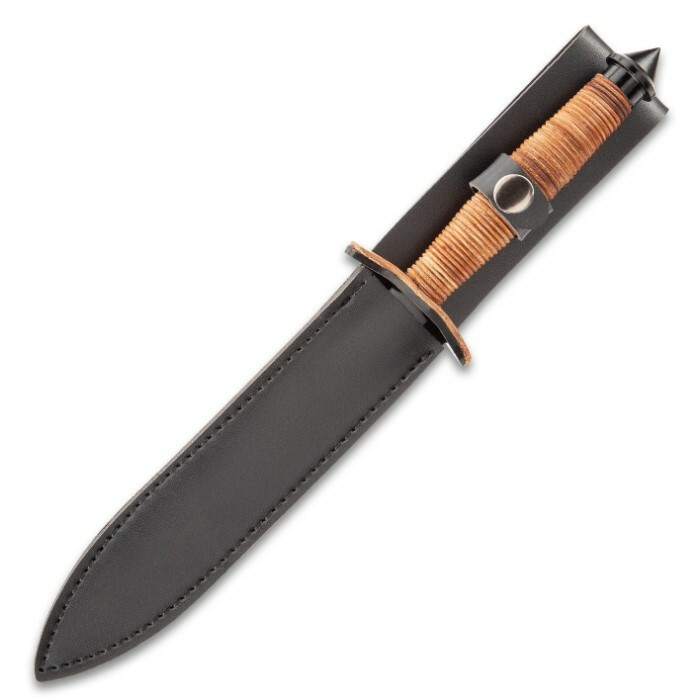 From reading other reviews, this V42 Military Stiletto is definitely a "your mileage may vary" item, It's obvious the manufacturing quality control is lacking or nonexistent. You either get a really good one or a sloppy one. The one I received falls in the latter group. The handle was as loose as a goose! The end cap was tightened down as far as it would go, but the handle and guard were still so loose they rattled. I was able to tighten it up by adding a couple leather "spacers" to the end of the stacked handle. The spiked end cap is some kind of softer cast metal so be careful when threading it off and on or the steel threads on the tang will strip the shallow threads in the end cap. The good aspects of the knife are that it has a VERY sharp fine point, and the blade and tang shaft are one piece. Unlike the M1918 which has the blade spot welded to the tang shaft. The knife does have decent accurate details including thumb ridges on the hilt of the blade like the original. The leather handle and sheath are decent - okay quality. Bottom line, NOT worth the $20 price tag, and I don't expect much for $20! lol I missed the promotional BOGO and paid regular price. Knife will be okay for display or collecting with limited handling, but not something to expect to use even occassionally...I wouldn't trust my life with it! It's a cool knife with historical significance, so I hope the quality improves. I order the BOGO (buy one, get one free) package and examined the daggers when they arrived. One was OK, the second one fell apart in my hands. Both were returned for a refund. Good knife for the price. Better than average leather sheath. Leather handle with steel brace insert. Full rat tail tang which is what this style knife is supposed to have. No welds, one piece steel. Tip is needle sharp. Blade is not, but it isn't a slicing knife. Easily sharpened. So it's a good knife.Really good. Especially for $19 or less. Stolen from the review from GAF - "An OK copy" below": If handle is lose, unscrew the skull cracker, tighten the nut, screw skull cracker back on." Because that's the fix. Five minutes if you are slow and have to find your crescent wrench. Well worth the minor trouble if the nut is loose. Very tight construction for the value....like the leather brace! Easy to sharpen! Not bad had a loose hilt but was easy fixed. Sharp very sharp point. Heavy leather scabbard. I like two for one or bogo.works for me.Go ahead get it you won't be sorry. It's an OK copy of this military dagger. The case is totally wrong for this but remember it is an inexpensive COPY. Real V-42s are rare and cost $1000s. If handle is lose, unscrew the skull cracker, tighten the nut, screw skull cracker back on. It does fit into a M8 or a M8A1 military scabbard but not the way they did it. Sharp with a fine tip.